And by test it out, I mean spend the next three hours finding the perfect cover photo. Facebook timeline doesn’t reset your privacy settings or anything, but it does make it easier for people to creep on you, and for you to creep on them. Your entire life is displayed, scrapbook-style, to the masses instead of being hidden behind a “show more posts” barrier. You can navigate by year, by friendship and even by location. Activity Log – Creep on yourself! 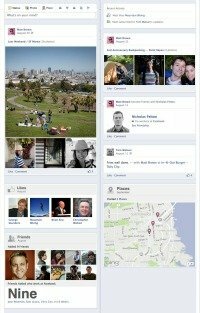 See everything you’ve done, from the moment you joined Facebook up until now. Only you can see this, and you can go through all of your posts and individually adjust their privacy settings or hide, delete or feature them. Hide or Feature Stories – If you’re proud that you finally finished cross-stitching Justin Bieber’s face onto a decorative pillow but don’t want the whole world to know about it, you can write up a little story/event and either hide it from your timeline or change the privacy settings to “only me.” And if you’re really excited about your crafty, yet creepy, skills? Feature it. The Look – It’s pretty. I’m digging the cover photo idea. Bizarre Life Event Categories – While Original Facebook focused more on present day happenings, timeline focuses more on life events. That’s fine and dandy, but Facebook and I have different definitions of “life events.” For example, I don’t consider getting “glasses, contact lenses or corrective surgery” to be a life event unless you were blind yesterday and just got out of sight-restoring surgery. The same goes for becoming a “vegetarian, fruitarian or omnivore,” getting a new roommate, getting a new car or taking your first drink. Marriage, yes, buying a house, yes, surviving cancer, yes. But renovating my bathroom? Not so much. And…that’s it. Even though timeline is a huge overhaul, it’s easy to use and it looks fantastic. Not much to complain about! And if you’re one of those haters who isn’t comfortable with your entire online life being exposed, timeline is your wake-up call. All of those revealing, embarrassing, horrifying photos and posts? They were always there. In fact, you put them there and you let them stay there. If you’re busily hiding them from your timeline right now, maybe you should think twice about what you post online.